I'm behind this year.... It's week 3 of 12 Weeks of Winter Squash, one of my favorite food blogger events... But I missed the first two weeks this time. This year our event is hosted by LeAndra at Love & Flour. Last year I actually made a recipe for each of the 12 weeks! It was a goal of mine since we had so many winter squash and many varieties. I think this is my third year participating in this event and I'm going to try to hit as many weeks as I can. You'd think I'd run out of new ways to use winter squash, but it hasn't happened yet! 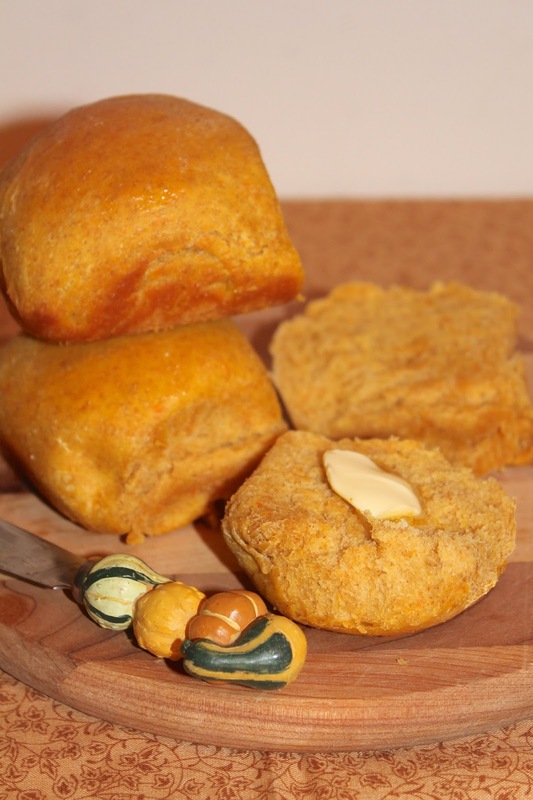 This recipe infuses winter squash puree into light and fluffy dinner rolls. There's still time to add these to your Thanksgiving dinner menu. They make a perfect bread to accompany your meal with their light orange color. They don't taste overwhelmingly of squash, especially with the bit of whole wheat flour, but you can detect it. Keep this recipe around to go with your soups and chilis as well all through the winter. I used butternut squash puree, but pumpkin, acorn, kabocha, or any thick winter squash puree will work. 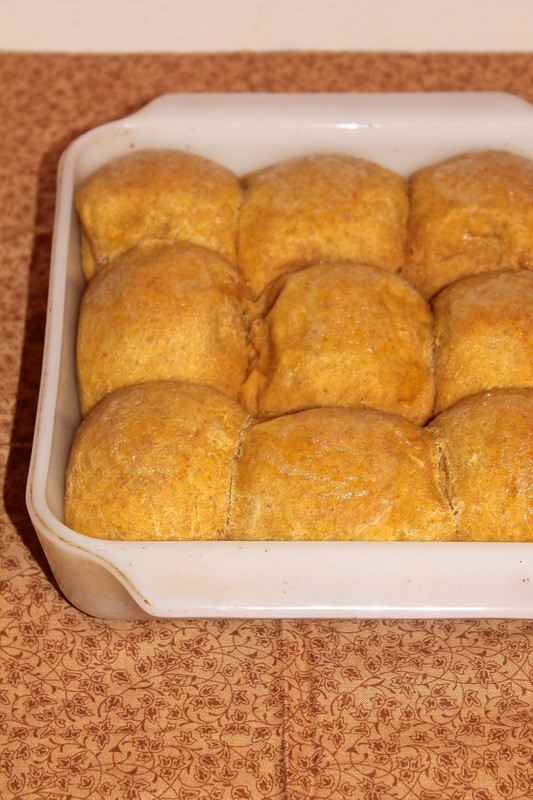 This recipe will make about 9 dinner rolls, depending on how much flour your dough takes up. In a large bowl, stir together the yeast, milk, and honey and let sit for 5 minutes (until it foams a bit). Stir in the squash puree, salt, and olive oil. Then stir in the whole wheat flour. Begin to stir in the all-purpose flour about 1/4 cup at a time. You want the dough to come together and be just slightly tacky. At this point, I begin using my hand to incorporate the flour. Knead the dough for about 5 minutes on a lightly floured surface (adding more as needed), until it becomes smooth and elastic. Shape into a tight ball. Lightly oil a bowl and then place the dough in the bowl. Cover and let rise in a warm place for one hour. Lightly oil an 8" x 8" baking dish. Gently push down the dough and divide it into individual balls, about 1/3-1/2 cup in size. Place the dough balls into the baking dish so that they are close to one another. Cover and let rise again for about 45 minutes. Preheat the oven to 375 degrees. Uncover the rolls and bake them until they are golden and sound hollow when tapped, about 25 minutes. If desired, when the rolls are almost finished, brush them with melted butter and return to the oven for 2-3 minutes. Let the rolls cool for at least 10 minutes before removing from the pan. Check out other winter squash recipes below and join us if you are a fellow food blogger! Hi Amy, love the color of these rolls, I bet they are delicious! They look soft and delicious! What a great idea for Thanksgiving. Amy, your winter squash rolls have an amazing warm and rich color - they must have tasted absolutely wonderful! These rolls sound ah-mazing, Amy. So delicious, warm and comforting for these snowy days! YUM! What an amazing idea to add squash in to rolls. A great way to make them much more filling and comforting. These sound delicious Amy - like the bread version of our pumpkin scones. Awesome rolls Amy, I love the flavor and color of these rolls...perfect for Thanksgiving! Ahhh way to make homemade dinner rolls even better than ever! Great idea and Happy Thanksgiving! I don't think I've ever had squash in a dinner roll. Wonderful idea! So much flavor! Really creative -- thanks. And Happy Thanksgiving! Hi Amy, your dinner roll look good. The texture look soft and fluffy. Thanks for sharing your recipe. Happy Thanksgiving to you and family. I love this recipe- with whole wheat and AP flour! They look so tender! I am def. trying this! Oh how I wish these would be on our Thanksgiving table! They look delightful! These dinner rolls look gorgeous. What a perfect holiday side.